It is with great sadness that we announce the recent passing of Professor Paul Bridges MBE, former chair of NUCCAT and the UK Credit Forum (UKCF) who died on the 14th September 2017 aged 69. During a 41-year academic career at the University of Derby Paul held several roles including, before his retirement in 2013, Head of Research and Clerk to the Governing Council. 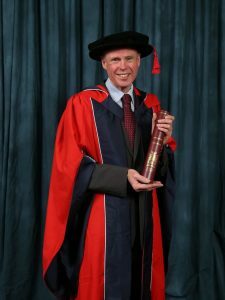 He was awarded the MBE for services to education in 2013 and an Honorary Doctorate of the University of Derby in 2015 (picture). Paul was instrumental in the success of NUCCAT since its inception and the driving force behind UKCF, with a genuine passion for student mobility through credit recognition and transfer which impressed and enthused all who worked with him. NUCCAT sends sincere condolences to Paul’s wife Madeleine, his son Ashleigh and his many friends and colleagues.